"Yep, I'm a homeschooled kitty!" Have questions on where I am finding ideas for curriculum and resources? Check out my post here. Monday - T is for Tent is the theme of the week in God's Little Explorers. We "camped" under our dining room table and read "God's Friend - God's Promise" in "Jesus Calling." It was about Abraham (Genesis 15; 17-18) and Mark 10:27, where nothing is impossible with God. We made T's and t's with our hands and fingers. The verse this week is Galatians 3:6 and we practiced the phonics of letter T.
Lesson #47 in "100 Easy Lessons" - new words included or, for, goat, coat, need, have, cold, give, and gave. Daddy doing reading lesson with B, and G playing. Tuesday "Media Day" - We learned about everything with the letter I on Sesame Street while B was not feeling well. I is for Iggy, ice, and ice cream. B learned about Gg and Hh on ABCmouse and the boys built words on pbskids.org with Super Why. Wednesday - We went over Abraham and how he had to travel for so long and kept having to change camps to follow God. I asked the boys what would they see at night if they were camping. Their answers included God, Jesus, lightning, thunder, rain, the moon and the stars. We read, "The Four Friends" and "The Mouse Bride" from by: Bob Hartman. The cool thing about this was I could not find the book but my local library had an ebook version of it so all I needed was my library card and we had access! We also read, "Where the Wild Things Are" by: Maurice Sendak on bn.com. Other books included "Pizza Party" by: Joshua Sternin and Jeffrey Ventimilia, "Bolt" by: Apple Jordan and "TMNT Magnet Book" by: Peter Laird and Kevin Eastman. Thursday - We read "Goodnight Moon" by: Margaret Wise Brown. Saturday - We read "Thank God for Good Health" by: Stan and Jan Berenstain and "Beware the Green Goblin" by: Tomas Palacios. Wednesday - The boys learned "Twinkle, Twinkle Little Star" and we sang and danced to the rhyme and then colored a booklet. Thursday - B colored the flag for India and the map of India because India was our country of the week. We did a finger play from the Five in a Row blog called "The Big Yellow Moon." We also swam at the pool today and learned why it's important not run at the pool. B spotted a stick bug while we were at the pool! Saturday - We sang "Father Abraham" again and went swimming. The boys learned "Hickory, Dickory Dock" and did a color and paste craft project. We also had fun being silly switching out the word "one" out of the nursery rhyme and switching it with numbers 2-10 and new rhyming words. B also colored in the "My Goodnight Moon" book, and matched the rhyming words. Monday - We went over Mommy and Daddy's names and our last name. B answered Reading comprehension questions from his reading lesson. Wednesday - Opening night at Awanas. Thursday - Reading comprehension questions from the stories we read on Wednesday. The boys played a rhyming game with words and pictures from Five in a Row for "Goodnight Moon." G doing puzzles while his brother worked on his lessons. Saturday - We practiced what to do when there is someone at the front door. We took turns and role played and asked, "Who is it?" before we opened the door. Monday - We did a numbers review for 9-12 in our Math Readiness book. The boys had to count the number of items and use subtraction and addition with stickers. Tuesday "Media Day" - We had a review on number 20 on Sesame Street. G did Lesson 4 in ABCmouse on numbers 1-5. Wednesday - B did Lesson 10 on ABCmouse, also on 1-5. He had to pick the number he heard, and Bowling Addition game where he had to add the numbers to the equation that would equal 10. Saturday - We did a shapes review and cut out 10 squares that B drew stars in and also a triangle for a tent, to signify Abraham's tent. We then glued these items onto black construction paper to pretend like it was night. Tuesday "Media Day" - Both boys learned about eating a healthy, balanced meal (fruits, vegetables, protein, dairy, and bread) on ABCmouse. They then went exploring to pbskids.org to a dinosaur game where they had to pick the words and phonics of the picture to create an illustration. Thursday - Our country of the week was India. We learned that India is in Asia and where it is in comparison to North America, the United States and our state. That is our week. Hope you all have a safe and happy Labor Day weekend! Save up to 60% on all Disney's Frozen apparel, toys and gear at zulily on Thursday, August 28th! With Disney's Frozen being the highest grossing animated film of all time, this is sure to be the wish on every little girl's gift list this year, so you are not going to want to miss this sale. To get you and your little one in the spirit of the sale, zulily has put together some special tutorials on how to create the magical updos and braids of Anna and Elsa. Share these images with your friends, and don't forget to tell them about the zulily Frozen Sale. This is one of my favorite verses in the Bible. It is so simple and yet because of that, we almost miss it. Little children are innocent and their imaginations are so remarkable that just by you being excited about something, they not only believe, but want to know more. They are so open minded because they have not seen the many harsh realities of the world that are out there. As parents, we try to protect them from this world and keep them in a world that is living for the glory of God. God has this extraordinary way of opening up His world back to us as adults. My father and my oldest son are very similar in the aspect that they are both extremely social and outgoing and they love talking to everyone! I am more of a shy person until I am comfortable in my surroundings and have gotten to know people, quite like my youngest son. I have noticed though, how people stop and not only open up and talk, but are delighted by the conversations initiated by my father and oldest son. We encountered two scenarios at our community pool this week that I am so incredibly proud of both of my sons for. Do you ever notice how children can just make friends in the second they meet another child, and how as adults we become more skeptical of people? That day at the pool, my sons met a little boy about their age. He was there with his grandmother and my oldest ran right up and introduced himself and his brother and asked what their names were. I kindly smiled, but something in me said to do more, so I started a conversation. I borrowed a lesson from what my son always does and you know what? We ended up at the pool having a wonderful day for almost three hours! The children got to play and neighbor got to know neighbor. That’s what God designed us for. He wants us to not only fellowship with Him, but he wants us to fellowship with each other. The other scenario was horrific, but God always has a way to turn bad events into good ones. 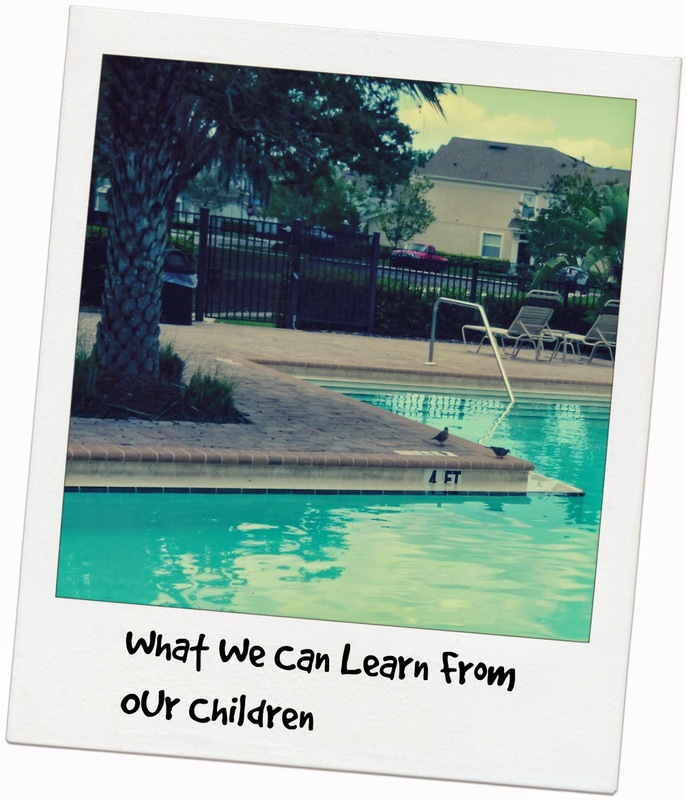 My sons and I went to the pool and there was more of a separation at the pool that day. There were some people sitting independently just tanning and relaxing, and others just wanting to spend time with their own families. Children don’t see that scenario I just described though. They saw children there and that meant they wanted to make friends and play. All was going smoothly until a group of people showed up. There was one child in this group that went beyond the call for attention, and at one point, had a pool of about 23 people silent because of her behavior. This was more than the grocery store melt down, which all of us as parents have run into no matter how good our children are. I was completely taken aback by the behavior as were the other parents at the pool to the point where we all almost left. The only one not affected was the child’s mother who seemed to be the only person not hearing the cry for attention. Suddenly something amazing happened. My sons and the other children at the pool “killed” this child with kindness. They let her know her behavior was not acceptable because they started to ignore her. They didn’t react in a negative fashion or get confrontational, but they continued to enjoy their time at the pool. Eventually, this child got the concept and she began to play with the children and there were no more episodes. Sometimes, as adults, we want to get confrontational or react in a negative way when someone is bullying or not treating someone fairly, but that’s not our place, it’s God’s. I don’t know what the mother of that child or the child have going on in their lives, but it’s none of my business. All I could do was pray for them. I also acknowledged and gave praise to my sons for how loving and kind they were to someone who at the time really didn’t deserve to be treated so nicely. It is good to give praise to your children when you see them doing something good. I believe this is what Jesus wanted not only his disciples to know, but also us. Come to the Lord open and excited so that you may see the world through His eyes and children’s eyes. See possibilities and not failures. See hope and not loss. See dreams and reach out and find a way to make it happen. See others as God’s creation and love them for who they are. Is there a time you encountered a problem and saw how God turned the situation from a bad one into a good result? What are some things that you have learned by seeing your children do something? This post originally appeared as a guest post on Satisfaction Through Christ on August 27, 2014 here. I am honored this morning to be doing a Blog Swap with one of my fellow Satisfaction Through Christ contributors authors, Michelle Lesley. 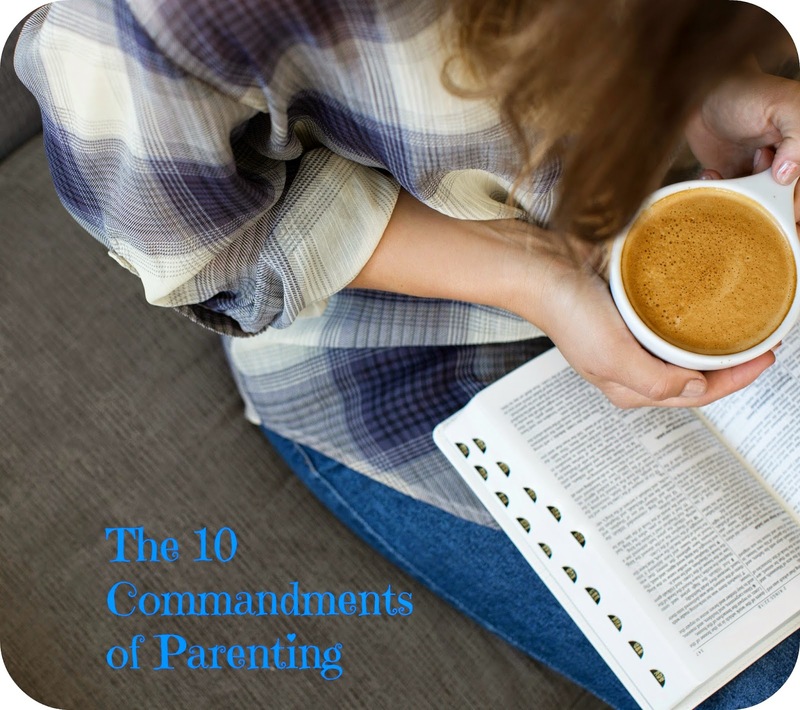 She is a wonderful Christian women who is sharing today one of her posts from a series she wrote called "The 10 Commandments of Parenting." "Most things in life are simpler when you’re a Christian. Not necessarily easier, but usually less complex. Take parenting, for example. If you’re a Christian, parenting by God’s word, you have a plan of action all laid out for you." Continue to the rest of her amazing article here. Hope everyone had an awesome summer and thanks for joining us for our homeschool journey! Last week started back to homeschool for us and overall, was really excited about how much we got done. First day was smooth sailing and for the second year in a row, the second day crashed and burned but we got right back up and everything has been fine since. I am learning it is best to take it day by day and be in the moment. My youngest being Max, King of the Wild Things From Maurice Sendak's, "Where the Wild Things Are." Monday - We started God's Little Explorers and talked about the Bible and what it is (God's Word). We read "We're Going on a Bear Hunt" by: Michael Rosen and Helen Oxenbury. We actually then acted it out in the house and pretended our dog was the bear! It was a lot of fun! Tuesday - We discussed that God's Word is a Treasure (the theme of the week). We read "How to Make an Apple Pie and See the World" by: Marjorie Priceman. We then shared some yummy sliced apples! We read and listened along to the CD song/story of "It's Raining, It's Pouring" by: Peter, Paul and Mary and Illustrated by: Christine Davenier. I had never heard this song before on this CD and it was truly wonderful. We also read "Cloudy with a Chance of Meatballs 3: Planet of the Pies" by: Judi Barrett. B did Lesson #46 in "100 Easy Lessons" and his new words and sounds this week were: v, of, save, give, and have. Wednesday - "The Story of David" (David Spares Saul) 1 Samuel 24 where David cut Saul's robe and let him know he could have killed him. Saul proclaims what a better person David is than he and says what a great king he will make. We also covered "Poems, Songs, and Prayers" Psalm 23;100 where it discusses calling on God when you are afraid and being thankful. Monday - The boys and I sang and danced to the "B-I-B-L-E" song. We took a walk and went swimming, where the boys learned how to tread water. We also made a Teenage Mutant Ninja Turtles Inspired Alphabet Book. Tuesday - We made a Passport booklet and B drew a picture of himself and G in the photo slot. We talked about how you need a passport to get into different countries and how they stamp where you have been, so we got some stamps out and had fun stamping all the places we learned about in "How to Make an Apple Pie and See the World." Wednesday - We learned the Nursery Rhyme, "Pat-a-Cake." Daddy went into work later so he could help with writing the rhyming words. Thursday - We went swimming and took a walk, and listened to the "B-I-B-L-E" song. Friday - We learned about Humpty Dumpty and made Humpty Dumpty out of an Easter egg, Play doh, and construction paper from the Scholastic Follow-the-Art Directions book. G kept saying, "Momma, I broke him again!" after tossing our plastic egg from the table! He loved it! We also learned the nursery rhyme, "Humpty Dumpty." Monday - The boys went on a treasure hunt in the house for Momma's Bible, flash cards, and crayons as part of the God's Word is a Treasure theme. I taught them how to play "Warmer and Colder" to show how close (warm) or how far away (cold) they were from the objects hidden. G matched Pom Poms to the color of the turtles masks from our Alphabet book. Tuesday - We watched "Blueberries for Sal" on YouTube and then went for a blueberry hunt using blue colored Pom Poms and the Ninja Turtle toy figures came along to help the boys! B answered reading comprehension lessons from his reading lesson. Wednesday - We had a Play doh day and made cakes for the nursery rhyme "Pat-a-Cake." We also put letter X into the Alphabet book because X marks the spot on a treasure map. Thursday - Today, we introduced Calendar Time and I tried to teach B "Tic-tac-toe." We went on a treasure hunt with gold coins with the words: God's, word, is, a, and treasure. The boys also met a new friend at the pool. Tuesday - The boys did green, yellow, and red apple patterns in their Clifford magazine and we covered more or less with different pictures of fruits and their seeds. Wednesday - We did a refresher on numbers 1-8 in our Math Readiness book and did addition and subtraction (pages 26-29). Thursday - Our shape of the day was a rectangle and played a game with dice where you had to get to the finish line where the Bible was. (Race to the Hive from The Mailbox) The boys learned to count the dots on the dice and spots on the board. Friday - In our Humpty Dumpty craft, we compared short to long and then folded the arms and legs into squares. G called them stairs! B also helped me measure the ingredients to make some homemade ranch dressing! Monday - B spelled troll from memory by reading "The Three Billy Goats Gruff" so much! Tuesday - B wrote: apple, his name, his cousin's name, V, v, H and h.
Wednesday - Rhyming words from Pat-a-cake: man, can, fan, pan, tan, van. Thursday - B wrote out his pets names, Mommy and Daddy's names, and his address and phone number. Monday - G did pbskids.org and played Martha Speaks games. We also did a back to school sheet with what the boy's favorites are. Tuesday - We learned that Vermont has apples and is in the United States, semolina wheat is from Italy, chickens that hatch eggs come from France, bark of a kurundu tree produces cinnamon from Sri Lanka, cows produce milk in England, sea salt is in the ocean on the way to Jamaica, and Jamaica has sugar cane. These are all the countries and ingredients for apple pie in the book we read. We also did a Clifford magazine from September 2010 and learned how an apple starts out as a blossom and turns into a green bulb that eventually becomes a red apple. Thursday - B did ABCmouse.com Lessons 6 and 7 (Around the World Pets and Reading Aa to Ff). He did puzzles, color by number sheets, and matching pictures to words. We also learned what city we live in and what our address and phone number are. We made a demographic puzzle inspired by The Early Learning Coalition calendar in the county where we used to live. Friday - We did a review of our demographic puzzle and tried to fit the pieces back together! How did your first week of homeschool or sending your kids back to school go? Did you do anything fun that has become a tradition for the first day or week back to school? I thought it would be a good idea to list what curriculum and resources we are using this year to not only document for my sons, but also if you would like to know what we are using. I must warn you, I am eclectic in my choices so I like to use a little bit of everything that I think my sons would be interested in. Every homeschool family and student are different so use what you think your children would be interested in. That makes learning easier for everyone! 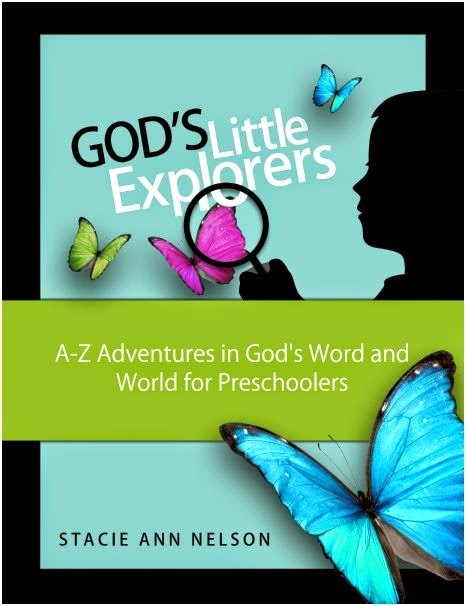 God's Little Explorers - Check out my review on this here. Follow me on my Pinterest Kindergarten Board so you don't miss some of the cool ideas I find! I love Pinterest and how creative everyone is! Here is the link for my Pinterest Preschool Board. Jesus Calling Bible Storybook by: Sarah Young. After we are finished with this, I am planning on using CalvaryCurriculum.com. We are doing nursery rhymes this year for both boys. It is not only fun, but it teaches phonics and reading skills along with some rhythm and exercise! YouTube is also a great way to find ideas for music and cute nursery rhyme videos. 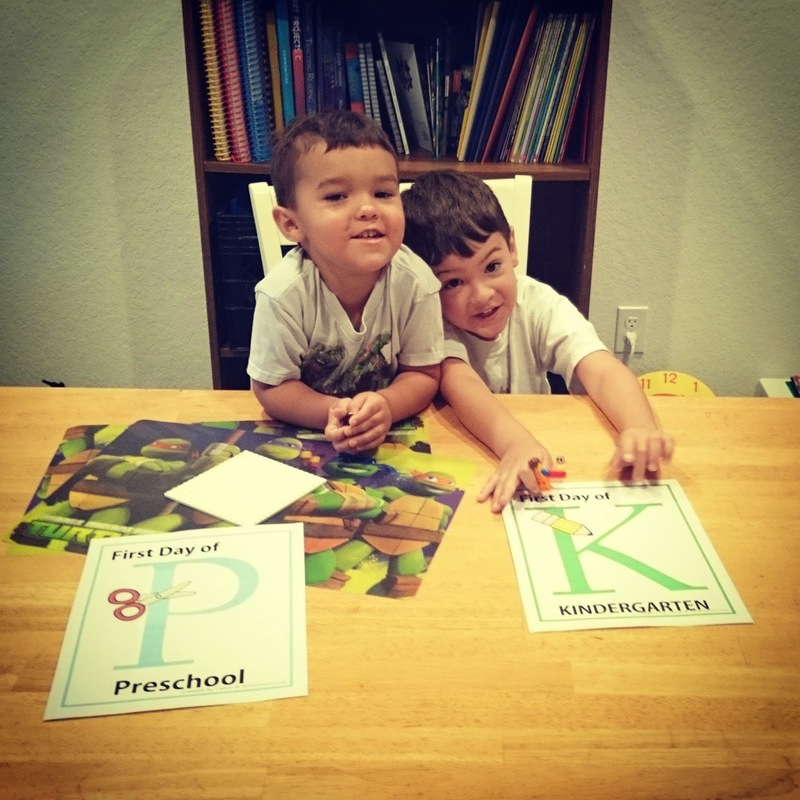 Check out this post from Living Montessori Now for some back to school center songs and nursery rhymes. We are using Scholastic Follow-the-Directions Art Nursery Rhymes book by: Deborah Schecter and Scholastic Nursery Rhyme Flip Chart book. Happy and Blessed Home put together this amazing set of printables and it is free until September 30, 2014. Family Time Fitness. We also like to go for walks, go to the playground and swim. 1. Teach Your Child to Read in 100 Easy Lessons by: S. Engelmann, P. Haddox & E. Bruner - I've been working with my oldest since last year on this when he was doing pre-K. He is halfway done the book and knows about 120 words to read and spell! DonnaYoung.org offers free printables to go along with this book. 2. Five in a Row - fun lapbooks and file folder games with book recommendations. 3. BOB Books - This Reading Mama has amazing sets of printables to go along with these adorable books! A+ Interactive Math TutorSoft Inc. and SchoolZone Math Readiness P-K by: Jennifer Neumann. I plan to use whatever we are learning for the week to practice writing, spelling and vocabulary in their Teenage Mutant Ninja Turtles Inspired Alphabet Book. ABCmouse.com - It is worth every penny! The boys get to do ABCmouse.com when they are done their studies for the day and I feel like it covers any gaps that I have missed. It also helps them learn how to use the computer. The Mailbox - great for printables, crafts and center ideas. If you are wondering how to put all of your homeschool materials and what you covered throughout the year, check out my post here. Well, that's about it! I will update this post throughout the year. It looks ambitious but I am excited and glad to be back to a routine and some pumpkin lattes! What grades are you teaching this year? What curriculum and resources do you and your family enjoy? 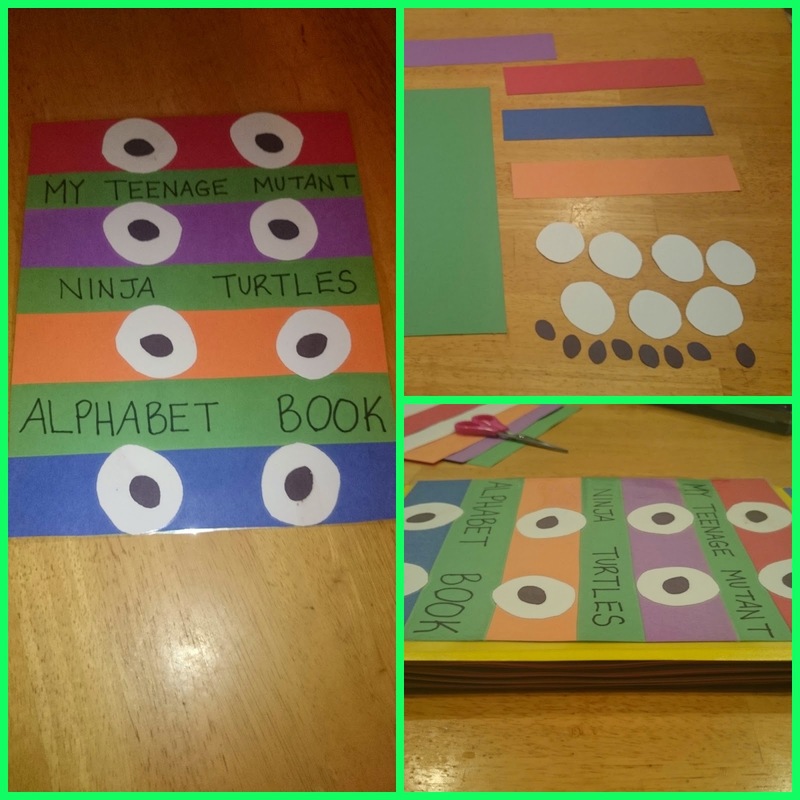 Teenage Mutant Ninja Turtles Inspired Alphabet Book! Do you have a Teenage Mutant Ninja Turtles fan in your house? My sons love the turtles and I was looking for a fun way to get my oldest (who is in Kindergarten) excited about reading and writing in an alphabet book. We found this amazing video on YouTube by Cool School on making a Ninja Turtles notebook and a light bulb went off! This is such a great project to work on with your kids and we had a blast watching the video from Cool School. Thank you for the inspiration! Glue the strips to the green construction paper. Glue the eyes to the masks. You can personalize the book now with your child's name! Time to laminate! After I laminated this, I glued it to a folder that has three prongs inside. I added other colors of construction paper to the inside and 3 hole punched the papers. I then wrote a lower case and capital letter on each page for the 26 letters of the alphabet. Now my son can use this throughout the year when he learns how to spell new words. We also are planning to cut pictures out of old magazines with items that start with the letter(s) or word(s) we are covering for that week. My preschooler actually had another idea with this when we were done. He used colored pom poms to coordinate each color to the corresponding mask color. We also counted how many colors we used, what color is this, how many circles are there, and how many rectangles we made. Well, it is that time of the year. Last trips to the beach, end of summer vacation plans, and back to school! 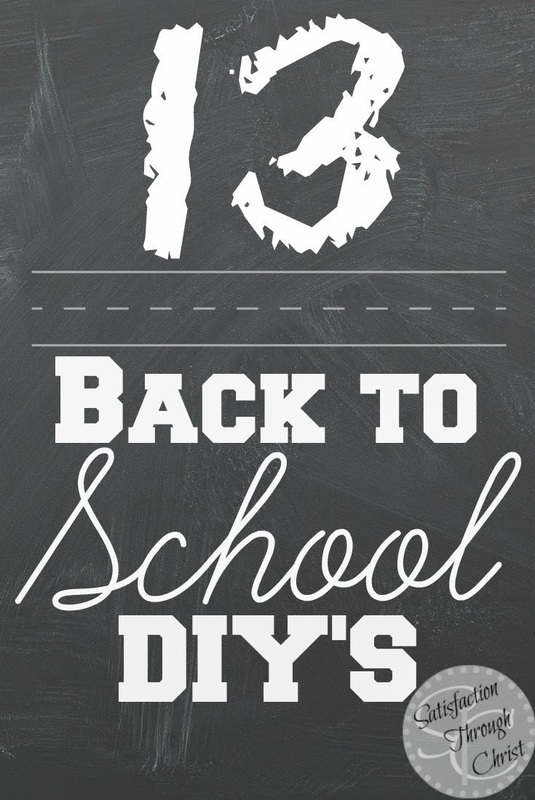 Today I wanted to share some amazing ideas I found on Pinterest to help you make it a great school year. It is amazing how creative people are so here are some great DIY’s for school supplies and projects, the home, and for yourself! The great news is: you probably already have most of the items in your house already! Great DIY’s for you, the home, and the kids for less than a pedicure! Plus, I made sure that these were easy to make and not time consuming. 5-Minute Liquid Laundry Detergent Recipe from The Thrifty Couple – I haven’t tried this yet but I bought all the ingredients and I’m super excited to try it out! Who doesn’t want to save on laundry detergent? There is also a great tip on using vinegar as a fabric softener and I have tried that! It works amazing and there is no stinky vinegar smell afterward! Back to School Essential Oils from Sisters Raising Sisters – I am late to the party on the essential oil movement, but I know there are many ways they can help with different ailments. This post is great for a beginner essential oils person like me because it breaks down 5 different oils and explains how each works with calming oils, oils that can be used with laundry or dish soaps, boosting up your immune system, and so many other ways to maintain a healthy home naturally. Homemade Glue from Life Over C’s – I haven’t tried this one yet but being a homeschool Momma to two boys under five, we can go through some glue in my house in a homeschool year! I love that the food coloring was added also to make different colors of glue! Homemade paint – I am trying to find the originator of this idea because when you click on the photo it doesn’t connect you to a link, but it is a great idea and there is no website to follow up on it. I would love to give the credit to this person because it is such a great idea for a mostly mess free paint experience! Edible Scented Fingerpaints from Fun at Home with Kids – This is such a terrific idea if you have a younger child who would eat the paint or for an older child who wanted to do a taste test also! Color Surprise Rainbow Playdough from Learn Play Imagine – Okay, I admit it. I have not made any homemade playdough yet, but that is changing this year! This looks like a fun, family project you could do to include everyone! Easy 2 Ingredient Cloud Dough from Happy Hooligans – I am excited to try this one also! My three and five year old will love this for some fun sensory play! DIY Uncrustables Recipe from TrueCouponing – I used to love these as a kid (…and as an adult!). Fun idea to send in the kids lunch boxes! Last, but certainly not least is you busy Momma. Light up a candle, enjoy a bubble bath, yoga, bake, read or do whatever it is your heart finds the most peace. Read Proverbs 31 10:-31 and remind yourself what a worthy, God and family loving person you are. I hope you find something on this list that you can do to pamper yourself. Sometimes, it’s not financially feasible for us to treat ourselves, or there may not be time, but make time for yourself. We do take care of our children, husbands, and everyone else before ourselves so make time for yourself to be rejuvenated. Easy Lemon Sugar Scrub from a Heart for the Home – This was really easy to make and it smells good and leaves your skin so smooth! Also, this is a great gift idea for a teacher! DIY Moisturizing Face Cream/Body Butter from My Crazy Blessed Life! – The author of this site says this works wonders for eczema; it doesn’t totally get rid of it, but it has helped her and her family. I bought the Vitamin E oil and I put 2-3 drops of it in my palm and rub it on my face after the lemon sugar scrub and my face has never felt or looked better! DIY Honey Shampoo from Empowered Sustenance – This looks like an awesome way to “treat dandruff, reduce frizz, moisturize and soften” your hair. I think it would also make your hair smell amazing! I love honey! DIY: Summer Ready Feet using Two Ingredients by Megan Fenno – I have heard of using Listerine and white vinegar mixed with water to soak off any excess dead skin from your feet to leave them silky smooth! I am excited to try all of this out and get some items on my Pinterest list completed! What are some of your favorite DIY items for you, your kids, or home? Hello everyone! It is getting to that time of year where our printers start working a mile a minute as us Homeschool Mom's get ready for the homeschool year! I was looking for a curriculum for my youngest who is 3 1/2 years old. I wanted something Biblical and something fun to keep his attention and I remember seeing God's Little Explorers on Pinterest a few months ago. There are two options to get this amazing product. You can pay the $17 homeschool price and it includes better graphics and more incentives such as an Alphabet Notebook, certificates, maps and puzzles rather than downloading the free printables that don't include these items. The proceeds are going to help set up an orphanage in India so the money is going to a good cause. Or you can download the free printables. Either way, this is a fantastic curriculum for a preschooler and I have printed all the lesson weeks and am excited to get started with this homeschool year! I will post pictures and more throughout the year as we go. Update: Winner announced in the Back To School Giveaway!!! 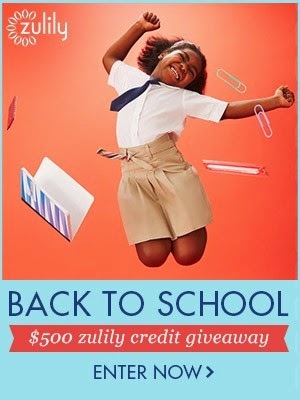 Win $500 in zulily's Back To School Giveaway!!! There is nothing better than getting all of your back-to-school shopping done in one place…unless you can get it done AND paid for! Enter to win the zulily Back To School Giveway where both you and I can each win $500 in zulily credits! While you're back-to-school shopping on zulily.com from 8/4 - 8/11, pick out your favorite item (apparel, shoes, accessories, gear and more) and post a link to that item in the comments section below or on my Raising Samuels Facebook page. zulily will announce their winner on 8/12, and if we win, I'll announce who my winner is on 8/13! Thanks zulily for making the task of back-to-school shopping fun! Please understand that this is a contest for both of us and that Raising Samuels is not giving out $500 credit as a prize, but by leaving a comment on my blog or Facebook, will go towards a chance of winning a $500 prize credit from zulily. Thanks and good luck!